What is the Harvard Referencing System? The Harvard citation style is a system that students, writers and researchers can use to incorporate other people’s quotes, findings and ideas into their work in order to support and validate their conclusions without breaching any intellectual property laws. The popular format is typically used in assignments and publications for humanities as well as natural, social and behavioural sciences. 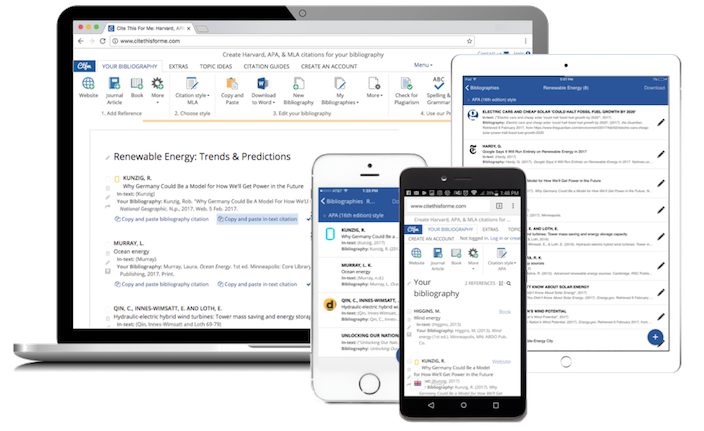 Whilst in-text citations are used to briefly indicate where you have directly quoted or paraphrased a source, your reference list is an alphabetized list of complete Harvard citations that enables your reader to locate each source with ease. Each entry should be keyed to a corresponding parenthetical citation in the main body of your work, so that a reader can take an in-text citation and quickly retrieve the source from your reference list. Note that some universities, and certain disciplines, may also require you to provide a bibliography. This is a detailed list of all of the material you have consulted throughout your research and preparation, and it will demonstrate the lengths you have gone to in researching your chosen topic. ‘Harvard referencing’ is an umbrella term for any referencing style that uses the author name and year of publication within the text to indicate where you have inserted a source. This author-date system appeals to both authors and readers of academic work. Scholars find the format an economical way of writing, and it is generally more accessible to the reader as there are no footnotes crowding the page. Only the name of the author, the publication date of the source and, if necessary, the page numbers are included in the parenthetical citations, for example: (Joyce, 2008). Use Cite This For Me’s Harvard style referencing generator to create your fully-formatted in-text references and reference list in the blink of an eye. Stop giving yourself extra pain and work for no reason and sign up to Cite This For Me today - your only regret will be that you didn’t use our open-generator sooner! The following guide provides you with everything you need to know to do justice to all your hard work and get a mark that reflects those sleepless nights. If you’re not sure how to format your Harvard style citations, what citations are, or are simply curious about Cite This For Me’s citation generator, our guide will answer all of your questions whilst offering you a comprehensive introduction to the style. Keep reading to find out why you need to use a referencing system, how to add citations in the body of your assignment, and how to compile a reference list. Sometimes, students do not encounter citing until they embark onto degree-level studies, yet it is a crucial academic skill that will propel you towards establishing yourself in the academic community. It’s a common mistake to leave citing and creating a complete and accurate bibliography until the very last minute, but with Cite This For Me’s Harvard referencing generator you can cite-as-you-go. So, if you need a helping hand with your referencing then why not try Cite This For Me’s automated citation generator? The generator accesses knowledge from across the web, assembling all of the relevant information into a fully-formatted reference list that clearly presents all of the sources that have contributed to your work. Using this Harvard reference generator to cite your sources enables you to cross the finishing line in style. It is important to bear in mind that there is a plethora of different citation styles out there - the use of any particular one depends on the preference of your college, subject, professor or the publication you are submitting the work to. If you’re unsure which style you should be using, consult your tutor and follow their guidelines. If your lecturer or department does not ask you to use a particular style, we recommend using the Harvard referencing system because it is simple to use and easy to learn. The powerful open-access generator above can auto-generate citations in 1,000+ styles. So, whether your professor prefers that you use the MLA format, or your discipline requires you to adopt the APA citation or Chicago citation style, we have the style you need. Cite This For Me also provides open generators and handy style guides for styles such as ASA, AMA or IEEE. To accurately create citations in a specific format, simply sign up to Cite This For Me for free and select your chosen style. Are you struggling with citing an unfamiliar source type? Or feeling confused about whether to cite a piece of common knowledge? This guide will tell you everything you need to know to get both your parenthetical Harvard citations and reference list completed quickly and accurately. Why do I Need to Cite? Harvard referencing can be a confusing task, especially if you are new to the concept, but it’s absolutely essential. In fact, accurate and complete referencing can mean the difference between reaching your academic goals and damaging your reputation amongst scholars. Simply put - referencing is the citing of sources you have utilised to support your essay, research, conference or article etc. Even if you are using our Harvard style citation generator, understanding why you need to cite will go a long way in helping you to naturally integrate the process into your research and writing routine. Firstly, whenever another source contributes to your work you must give the original author the appropriate credit in order to avoid plagiarism, even when you have completely reworded the information. The only exception to this rule is common knowledge - e.g. Barack Obama is President of the United States. Whilst plagiarism is not always intentional, it is easy to accidentally plagiarize your work when you are under pressure from imminent deadlines, you have managed your time ineffectively, or if you lack confidence when putting ideas into your own words. The consequences can be severe; deduction of marks at best, expulsion from college or legal action from the original author at worst. Find out more here. This may sound overwhelming, but plagiarism can be easily avoided by using our Harvard citation generator and carrying out your research and written work thoughtfully and responsibly. We have compiled a handy checklist to follow whilst you are working on an assignment. If you carefully check your college or publisher’s advice and guidelines on citing and stick to this checklist, you should be confident that you will not be accused of plagiarism. Secondly, proving that your writing is informed by appropriate academic reading will enhance your work’s authenticity. Academic writing values original thought that analyzes and builds upon the ideas of other scholars. It is therefore important to use Harvard style referencing to accurately signpost where you have used someone else’s ideas in order to show that your writing is based on knowledge and informed by appropriate academic reading. Citing your sources will demonstrate to your reader that you have delved deeply into your chosen topic and supported your thesis with expert opinions. Here at Cite This For Me we understand how precious your time is, which is why we created our Harvard citation generator and guide to help relieve the unnecessary stress of citing. Escape assignment-hell and give yourself more time to focus on the content of your work by using Cite This For Me’s citation management tool. How do I Create and Format In-text Harvard Style Citations? In-text citations are the perfect way to seamlessly integrate sources into your work, allowing you to strengthen the connection between your own ideas, and the source material that you have found, with ease. It is worth noting that in-text citations must be included in your assignment’s final word count. There are many assumptions when it comes to the information processing approach to cognition… (Lutz and Huitt, 2004). Why use a Harvard referencing tool? As well as saving you valuable time, Cite This For Me’s generator will enable you to easily avoid common errors when formatting your in-text citations. So, if you’re looking for an easy and free way to credit your source material, simply login to your Cite This For Me account, select ‘Cite Them Right - 10th Edition’, then ‘Create reference’, to copy, save and export each in-text Harvard citation instantly. How do I Format My Reference List? Utilizing and building on a wide range of relevant sources is a guaranteed way of impressing your reader, and a comprehensive list of the source material you have used is the perfect platform to exhibit your research efforts. A reference list is always required when you cite other people’s work within your assignment, and the brief in-text Harvard style citations in your work should directly link to your reference list. As a general rule a reference list includes every source that you have cited in your work, whilst a bibliography also contains any relevant background reading which you have consulted to familiarise yourself with the topic (even those sources that are never mentioned in the narrative). Your Harvard referencing bibliography should start on its own page, with the same formatting as the rest of the paper and aligned to the left with the sources listed alphabetically. Certain fields ask you to provide an annotated bibliography that includes your full citations with the addition of notes. These notes are added to further analyze the source, and can be of any length. Many people use the terms ‘reference list’ and ‘bibliography’ interchangeably, and if you are using the Harvard reference style you may be required to provide a bibliography as well as a reference list, so be sure to check this with your tutor. Creating and managing your reference list with Cite This For Me’s Harvard referencing generator will transform and improve the way you reference and conduct research. Bell, J. (2010) Doing your research project. 5th edn. Maidenhead: Open University Press. Hawking, S.W. (1998) A brief history of time: From the big bang to black holes. 10th edn. New York: Bantam Doubleday Dell Publishing Group. Shakoor, J., et al. (2011) ‘A prospective longitudinal study of children’s theory of mind and adolescent involvement in bullying’, Journal of Child Psychology and Psychiatry, 53(3), pp. 254–261. doi: 10.1111/j.1469-7610.2011.02488.x. Drogen, E. (2014) ‘Changing how we think about war: The role of psychology’, The British Psychological Society 2014 Annual Conference. The ICC, Birmingham British Psychological Society, 07-09 May 2014. Are you struggling to find all of the publication information to complete a reference? Did you know that our Harvard citation generator can do it for you? Accurate referencing doesn’t only protect your work from plagiarism - presenting your source material in a consistent and clear way also enhances the readability of your work. Closely follow the style’s formatting rules on font type, font size, text-alignment and line spacing to ensure that your work is easily legible. Before submitting your work check that you have formatted your whole paper - including your reference list - according to the style’s formatting guidelines. Even when using a Harvard citation generator, always check with your professor for specified guidelines - there is no unified style for the formatting of a paper. Make sure that you apply the recommended formatting rules consistently throughout your work. The author-date system is attributed to eminent zoologist Edward Laurens Mark (1847-1946), Hersey professor of anatomy and director of Harvard’s zoological laboratory. It is widely agreed that the first evidence of Harvard referencing can be traced back to Mark’s landmark cytological paper (Chernin, 1988). The paper breaks away from previous uses of inconsistent and makeshift footnotes through its use of a parenthetical author-date citation accompanied by an explanatory footnote. *The numbers immediately following an author’s name serve the double purpose of referring the reader to the list (p. 591) where the titles of papers are given, and of informing him at once of the approximate date of the paper in question. A tribute dedicated to Mark in 1903 by 140 students credits Mark’s paper with having ‘introduced into zoology a proper fullness and accuracy of citation and a convenient and uniform method of referring from text to bibliography’ (Parker, 1903). Today Harvard referencing is widely considered one of the most accessible styles and, although it originated in biology, these days it is used across most subjects - particularly in the humanities, history and social science. Due to its simplicity and ease of use, the format has become one of the most widely used citation styles in the world. Unlike many citing styles there is no official manual, but institutions such as colleges offer their own unique Harvard reference style guide, and each has its own nuances when it comes to punctuation, order of information and formatting rules. Simply go to the Cite This For Me website to login to your Cite This For Me account and search for the version you need. Make sure you apply consistency throughout your work. It is increasingly easy for writers to access information and knowledge via the internet, and in turn both the style’s guidelines and our open-generator are continually updated to include developments in electronic publishing. Cite This For Me’s Harvard style citation generator currently uses the Cite Them Right 10th Edition, which has evolved in recent years to match the rapidly advancing digital age. In order to avoid plagiarism, you must be cautious about pulling information from the internet, and ensure that you accurately cite all source material used in your written work - including all online sources that have contributed to your research. Previous editions required printed books and eBooks to be referenced differently - in the 10th edition, both are now referenced using the same template (if all the necessary information is available). An Ebook is considered to be the digital format of a published book (or a book that is only published in digital format) that is meant for reading on an electronic device. URLs are no longer a requirement for digital media if the information provided in the Harvard citation is sufficient to find the source without it. They should be included if the source is difficult to find, or pieces of source information - such as an author name - are missing. When a source has more than 3 authors, use the abbreviation "et al." instead of listing each out. These days students draw on a diverse range of digital sources to support their written work. Whether you are citing a hashtag on Instagram, a podcast or a mobile app, Cite This For Me’s generator will take care of all your Harvard citations, regardless of the type of source you want to cite. So don’t be held back by sources that are difficult to cite - locating unusual source material will help your work to stand out from the crowd. How do I Create Accurate Harvard Citations? Creating complete and correctly formatted citations can be a challenge for many writers, especially when documenting multiple source types. Our primary goal at Cite This For Me is to offer support to students and researchers across the globe by transforming the way in which they perceive citing. We hope that after using our open-generator and reading this Harvard referencing guide, what was once considered an arduous process, will be viewed as a highly valued skill that enhances the quality of your work. Disheartened by the stressful process of citing? Got a fast-approaching deadline? Using Cite This For Me’s fast, accessible and free generator makes creating accurate citations easier than ever, leaving more time for you to focus on achieving your academic goals. Create a free account to add and edit each Harvard citation on the spot, import and export full projects or individual entries, utilize our add-ons and save your work in the cloud. Things get even easier with Cite This For Me for Chrome - an intuitive, handy browser extension that allows you to instantly create and edit a citation whilst you browse the web. Use the extension on any webpage that you want to cite, and add it to your chosen project without interrupting your workflow. Cite on-the-go with your mobile phone or tablet - when you scan the barcode of your book with the mobile app, the generator will automatically add the fully-formatted citation to your chosen project. store/apps/details? Cite This For Me’s citation management tool is here to help you, so what are you waiting for? Accurate Harvard citations are just a click away! Chernin, E. (1988) The ‘Harvard System’: A mystery dispelled. Available at: http://www.uefap.com/writing/referenc/harvard.pdf (Accessed: 4 July 2016). Parker, G. (ed.) (1903) Mark anniversary volume. New York: Henry Holt. Create projects, add notes, cite directly from the browser and scan books' barcodes with a mobile app. Sign up to Cite This For Me - the ultimate citation management tool.